These little hoppers get a nice garlic bath after searing them. I used 6.5″ Lodge cast iron pans so everyone had their own serving. You can make them in a large pan and serve family style. They won’t last long. I served them along side roasted yukon gold potatoes and onions. Fast and Flavorful! These little hoppers get a nice garlic bath after searing them. I used 6.5" Lodge cast iron pans so everyone had their own serving. You can make them in a large pan and serve family style. They won't last long. I served them along side roasted yukon gold potatoes and onions. Fast and Flavorful! Cut the frogs legs in half to create individual frogs legs. Season the frogs legs with kosher salt and pepper, set aside. Coat 6.5 “ cast iron pans with a little grape seed oil. Heat the pans over medium high heat. 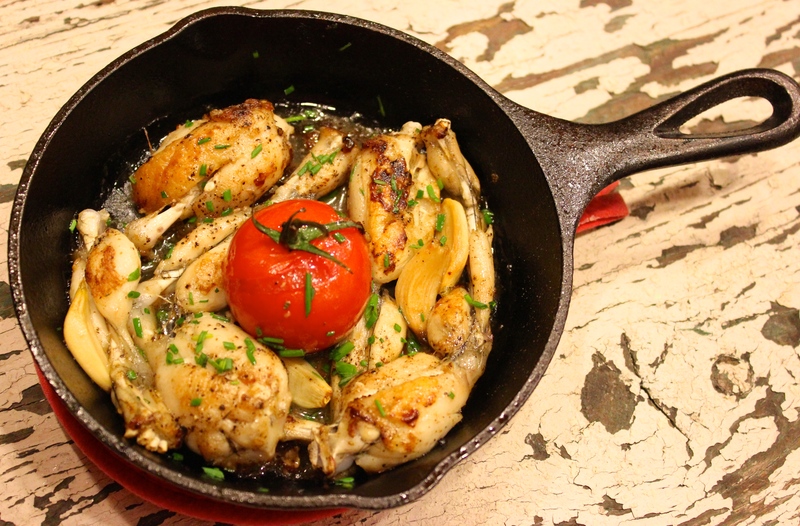 Sear the frogs legs, a few at a time, in the cast iron pans. Remove them to a plate until all the frogs legs are seared until lightly brown. Portion out the frogs legs in each pan and add four cloves garlic to each pan along with three tablespoons chicken stock to each. Place all the pans on a baking sheet and place them in the oven, uncovered to braise. Remove the baking sheet, and add a cherry tomato to the middle (if desired). Place them back in the oven and turn to broil, for 2 minutes. **Caution when serving individual cast iron pans… They will be extremely hot!